Dante, Glaucus and a "Weed"
and constantly, turning mine thence, I gazed on her instead. (from The Divine Comedy, translated by D.L. Sayers and B. Reynolds, Penguin Books, 1962). This text is of interest since it incorporates an analogy between Dante's gazing upon Beatrice, and the effect of a "weed" upon Glaucus. In order to understand this, it is necessary to refer to Greek mythology concerning Glaucus. In terms of Greek myth, Glaucus was a fisherman from Anthedon in Euboea. He was transformed ("transhumanised") into a god of the sea by eating a weed called a "marvellous herb" (Oxford Companion to Classical Literature, compiled and edited by Paul Harvey, Oxford University Press, 1969 revised edition). Virgil refers to Glaucus as part of Neptune's retinue (The Aeneid, Book V) prior to "the visit to the underworld" (The Aeneid, Book 6). The identity of the "weed or "marvellous herb" is not certain, but a question arising from the effect of this "weed" upon Glaucus may be considered in the context of certain herbs which have hallucinogenic effects. One possible herb sometimes referred to as a "weed" is Cannabis sativa, which is edible and which is known to have hallucinogenic properties. Studies of the effects of hallucinogens include the sensation of being underwater (Siegel, R.K., Hallucinations, Scientific American, 237, 132-140, 1977). It would seem possible that the Greek myth associated with the transformation of Glaucus, a fisherman, into a sea-god, may relate in part to the use of a hallucinogenic herb such as Cannabis. Dante Alighieri (1265-1321) was obviously aware of the Greek myth concerning Glaucus. Why he drew an analogy between the effect of a herb on Glaucus, and the effect of Beatrice upon Dante, requires an understanding of the lady referred to as Beatrice. She features in Dante's first major work, La Vita Nuova and has been described as the "glorious lady of his mind" (Macmillan Dictionary of Biography, revised by B. Jones and M.V. Dixon, MacMillan, 1985). Just as it is difficult if not impossible to identify the so-called "Dark Lady" who features in Shakespeare's Sonnets, so too is it difficult to identify the lady referred to as Beatrice in Dante's writings. 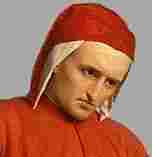 One possibility is that Beatrice is a perception in the mind of Dante. The text cited above from The Divine Comedy refers to Dante's intense gaze upon Beatrice, and the effect of this upon Dante, comparable to the effect of the "weed" upon Glaucus. Both relate to a "transformation". Dante states that when he saw Beatrice, "a change came over me". The question arises as to whether Dante's writings were themselves inspired to some extent, if at all, by the use of a "marvellous herb", the identity of which remains to be explored. One of the known effects of Cannabis is "extra sensitivity to light" (Conrad, C. Hemp for Health, Healing Art Press, Vermont, 1997). The perception of bright or brilliant objects ("entoptics") perceived in altered states of consciousness associated with hallucinations, may relate in part to Dante's perceptions of Beatrice, the "glorious lady of his mind" (Macmillan Dictionary of Biography, revised by B. Jones and M.V. Dixon, MacMillan, 1985). Beatrice may perhaps best be classified as an entheogen, perceived in the mind of Dante, himself a prolific writer. It may not be coincidental that the use of Cannabis, in moderation, stimulates creativity, including creative writing (Conrad, C. Hemp for Health, Healing Art Press, Vermont, 1997; Siegel, R.K., Hallucinations, Scientific American, 237, 132-140, 1977 ).